“Spinoza’s Dream” is a philosophically themed album, featuring musicians who played with Al Stewart on his classic albums. In this case, it was the critically-acclaimed powerhouse that had backed Al Stewart on his breakthrough 1976 album, Year of the Cat. Nachmanoff wasn’t starting from ground zero, exactly, given that he’s been touring with Stewart for a decade and a half, but this particular band — those that had survived the intervening 40 years — spanned the globe from Southern California to the UK, so wrangling them into a studio for a project was going to be no simple task. As they say, you gotta go big or go home, so Nachmanoff went big and left home, armed with phone numbers, introductions, a few songs, and a dream. Destination: Wales. In addition to musical legends Tim Renwick (occasional Pink Floyd, Elton John, and Eric Clapton co-conspirator, as well as a YOTC stalwart), smooth jazz superstar Peter White (a member of Al’s recording and touring bands for well over a decade), and Stewart himself, Nachmanoff also rounded up drummer Stuart Elliott, harmonica player Graham Smith, bassist Mark Griffiths, and vocalists Robin Lamble, Dave Ellis, and Boo Howard, all of whom (except the last) have either toured or recorded with Stewart. Bringing the sound all together was producer Martin Levan, who had helmed John Martyn’s Grace and Danger and Ralph McTell’s Water of Dreams, among other critical favorites. Dave Nachmanoff might be selling himself a teeny bit short there, as he has shared the stage not only with Al Stewart, but also with Alison Krauss, Cheryl Wheeler, Steve Forbert, Firefall, John Wesley Harding, and many others, at venues ranging from The Bottom Line to the Glastonbury Festival. His catalogue runs to a dozen albums, not to mention the Uncorked collection he produced (and played on) for Al Stewart. With tracks that reference the likes of Kant, Camus, Sartre, Kierkegaard, Aristotle, and Leibniz, among others, one might imagine the album is obliquely brainiac and difficult to digest; nothing could be further from the truth. It’s immediately accessible, both musically and lyrically, to any pop music fan whose IQ exceeds Paris Hilton’s weight. Hell, to any pop music fan whose IQ exceeds Paris Hilton’s IQ. Is it Year of the Cat? No. But neither is this. 2016 is the Year of the Monkey, and the monkey is characterized (zodiacally speaking) as being “…smart, clever, and intelligent. They are lively, flexible, quick-witted, and versatile.” That fits Spinoza’s Dream like a glove… whether you’re in a “morning from a Bogart movie” or not. Great music and interesting lyrics! I've listened to it several times and really enjoy it. It's hard to pick out a favorite little joke, when each song on the album is dedicated to a different philosopher, but he did put Hobbes ("life outside society would be nasty, poor, brutish, and short") next to Leibniz ("we live in the best of all possible worlds"). The Leibniz song, "All Good," sounds like a missing song from Candide (in which Dr. Pangloss caricatures Leibniz' views). The song for applying Giordano Bruno's sciency thoughts to current politics and infotainment was good, too. No Matter How Close is a fatalistic gem about Sartre's ideas. I think I'll post it separately in a few minutes, pairing it with one of my favorites from Scandinavian Music Group ("Lopulta olemme kuitenkin yksin", "We're all alone in the end"). The "hero" from "Bruise On My Soul" (Kant) seems to be a US Marine from the South, my native country. The songs are very well done and catchy, and in the style I can definitely detect the career with Al Stewart. I still enjoy the one I posted below, the title track, best. It's got a couple of melodic hooks that I need to sit down at a piano to see how they're so catchy. Two thumbs up! Listen to the songs and buy the album! 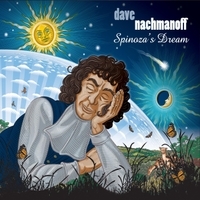 I'm listening to Dave Nachmanoff's new release "Spinoza's Dream" once again. And with each listen I like it even better than the previous one. This is such a rich album on so many levels. Intelligent and well-crafted lyrics, each tied in some way to a philosopher. This is a CD that will both entertain and teach you. Dave's vocals on this very well recorded album are spot on and blend well with the topics of each individual song. He also has an amazing band for this effort, most of whom played with Al Stewart on albums such as "Year of the Cat" in the 1970s. I heartily recommend "Spinoza's Dream". It's Dave at his very best.